This custom designed, contemporary style home boasts a total of over 2700 square feet with 4 bedrooms & 3.5 full baths (including the pool house) and is ideal for anyone looking for a private, retreat-like setting that's only about 5 miles to downtown greenville and even closer to shopping, restaurants, movie theaters, and other amenities! The kitchen boasts a huge dining area with a corner fireplace and lots of windows and natural light that looks out to the private, wooded grounds. The master bedroom is your own private get-away - separate from the rest of the home and features a full bath and walk-in closet. 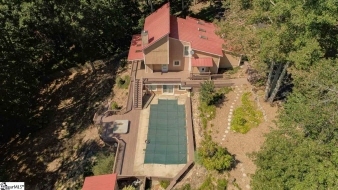 The home is gorgeous, but once you step outside you may not want to ever go back inside - over 2500 square feet of outdoor area, a large in-ground pool with pool house, and so much more! Call today for your private showing!